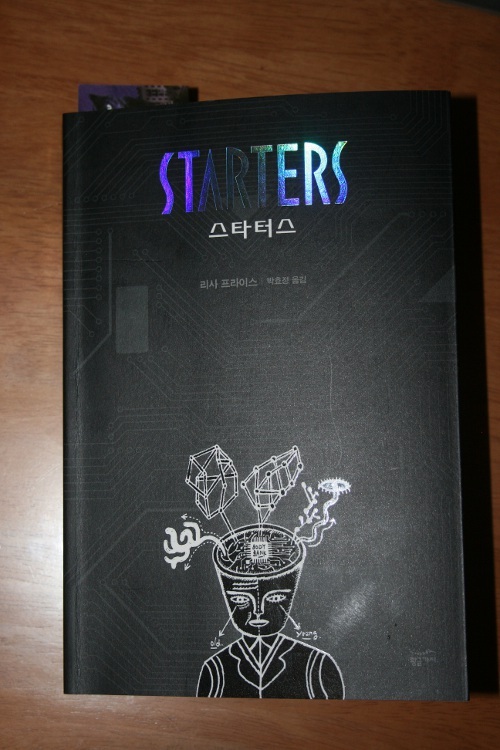 A Korean fan tweeted these photos of the amazing cover in Korea for STARTERS. They did it at three in the morning, saying they were staying up that late reading the book. I hear this a lot and I love hearing it every time. Then they were kind enough to tweet and to take these photos for us to enjoy. Can you see what it says on each eye? With so many countries, I have not had time yet to get any foreign editions except the beautiful hardback German one. Eventually, all the foreign publishers will send me their versions. But in the meantime, I treasure getting this information from fans. A Romanian blogger just told me her publisher sponsor wants to publish STARTERS there. We are taking over the world. What I love the most about this is how it shows we are one – the world has the same imagination and hopes and dreams. And now I get to share these photos with all with you! Next Post: The YAmazing Race with MGnificent Prizes!!! That cover is so pretty. OMG it looks gorgeous !! I don’t speak Korean nor understand it but these editions look aboslutely stunning !!! I am curious why other countries don’t just use the original cover when it is so cool? Some have (and thx for saying that). I believe France did and we have many more countries that bought the rights but haven’t completed production yet so we’ll see who else does. Mostly, they want to cater to their market. And I do like that it gives jobs to people in that country in the art department. I’m going to get a special display so I can show off all the covers. See the Korean cover on my site – I think the drawing underneath the half jacket is awesome! I am in love with that cover! & I loved Starters! Hey, my mom translated those other characters after your name. She thinks it’s the name of the translator, something like Hyojin Park. So that makes sense. Thank your mom for me, Eugene!